Today we are thrilled to announce that Clarabridge is one of the first business solution providers for WhatsApp. Beginning with a limited availability roll out, selected brands using CX Social, our dedicated social media management product, can now extend their customer service by communicating with their consumers via WhatsApp messaging. This is a game changing development for companies that want to meet their customers where they are—on messaging platforms like WhatsApp—and in new ways that provide tremendous business value. Consumers use messaging services such as WhatsApp and Facebook Messenger as a primary mode of communication — people across generations prefer to message than call or email. Messaging has changed the way consumers interact with each other and businesses must follow suit or run the risk of being less customer-friendly and approachable than those that do. Clarabridge customers that are getting ahead of the game with this early access program include Swiss International Air Lines and General Mills. According to Forrester, the number of consumers that use messaging has increased by more than 50% since 2012. Messaging is now table stakes for communication, and brands have tried to meet this consumer need through live chats over the web. Even though they represent an improvement over previous methods of communications, live chats are still very restrictive. Consumers are forced to stay in one place, on one screen, and wait for a customer agent to reply, only to lose all the information they were seeking as soon as they close the chat. Messaging apps, on the other hand, lower the threshold for a customer to reach out to customer service. While this interaction can occur in real-time, it doesn’t have to. A customer can ask a brand a question at home while having their morning coffee, read the answer during their commute, and reply during their lunch break. The permanent messaging structure also creates a historical transcript of the conversation that never disappears and can be referenced by both the customer and agent so questions and informative details don’t have to be repeated. When messaging with companies, the time customers must spend re-explaining an issue—often multiple times, to multiple different agents—goes down, which reduces cost to serve. 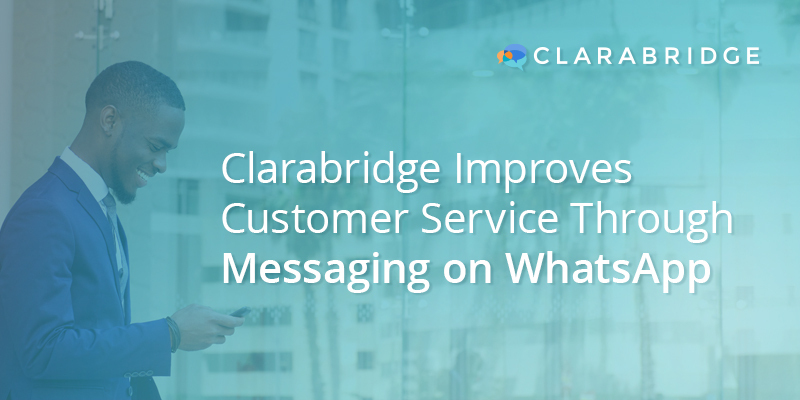 To get more value out of messaging, businesses can apply Clarabridge’s world-class text analytics to draw meaning from transcripts in aggregate to identify common issues across their customer base. Businesses can also send rich media assets to customers through messaging to help explain an issue, like a video tutorial of how to set up a product, or guide customers through self-service options which reduce calls to the contact center. Our new WhatsApp integration enhances the power of CX Social to drive fast responses and reveal deep customer insights. The solution empowers businesses to effectively support customer service agents, identify common pain-points and trends from customer feedback and track key metrics over time to improve brand perception and customer interactions. Customer engagement takes place in a central inbox with smart filtering, routing and prioritization, and automated workflows. Agents are given the tools to manage customer responses at the team and individual levels, tracking against critical KPIs to ensure they meet customer expectations. This is an exciting day for Clarabridge and the industry. Our new relationship with one of the world’s largest messaging platforms strengthens our commitment to provide the world’s best social media management and analytics solution the industry has to offer. Apply for WhatsApp’s early access today.